What to Bring to a Backyard BBQ? It’s the first days of September and Labor Day weekend, and LA is going through a late-season heat wave with triple-digit record-shattering temperatures. It’s effecting the whole state, actually, with unheard of 95°F heat in a typically chilly foggy San Francisco! But I digress. The point is, it’s super hot just about everywhere in California except right along the coast. So when my husband and I were invited to a backyard BBQ in Venice Beach just a few blocks from the ocean, the only thing we had to pause to think about was what to bring. Peak Season Alert: Fresh Figs are excellent right now - eat 'em while you can! And even that was not that hard because I’ve had figs on the brain all week, so whatever it was we were going to bring, it was going to be figgy. I didn’t have much time to prep or plan, so I went back to an old standby recipe and made some enhancements. It didn’t take long to put together, and was a real crowd-pleaser. I didn't know what I was going to make, but I knew it was going to be figgy. I plussed-up a basic roasted fig with goat cheese and balsamic vinegar recipe that I’ve made every fig season by adding brown butter and agave syrup to a balsamic reduction. I used this awesome big flake Icelandic sea salt (complete with legit Icelandic bramble) my sister brought back from a visit there (which I cherish and use sparingly). To contrast the sweet and acid, I put it all on a bed of peppery baby arugula. The flavor combination is awesome. I will make this again and again as long as there are excellent fresh figs to be had. I hope you try it, and let me know how you like it! Tips on how to choose good figs - not hard right now because they're sooo good! TIP: Look for figs that are heavy for their size, soft but not mushy, clean and dry with no ooze on the outside, which usually signals overripe fruit. TIP: Bring a serving spoon, and disposable bowls and forks to save hassle and clean-up for your host. Prep. Preheat oven to 400°F. Wash and dry figs. Start the balsamic-brown butter glaze. While the oven heats up and figs finish drying, in a small saucepan, combine balsamic vinegar, butter, agave and a big pinch of salt over medium-high heat. Bring to a boil then reduce heat to a simmer and let reduce for 10-15 minutes, stirring occasionally to incorporate browned butter bits that may have separated. Option: While this glaze is super delicious, the dish will also work great with a simple balsamic reduction without the butter, agave, or salt. Finish prepping the figs. While balsamic mix is reducing, remove fig stems and halve lengthwise. 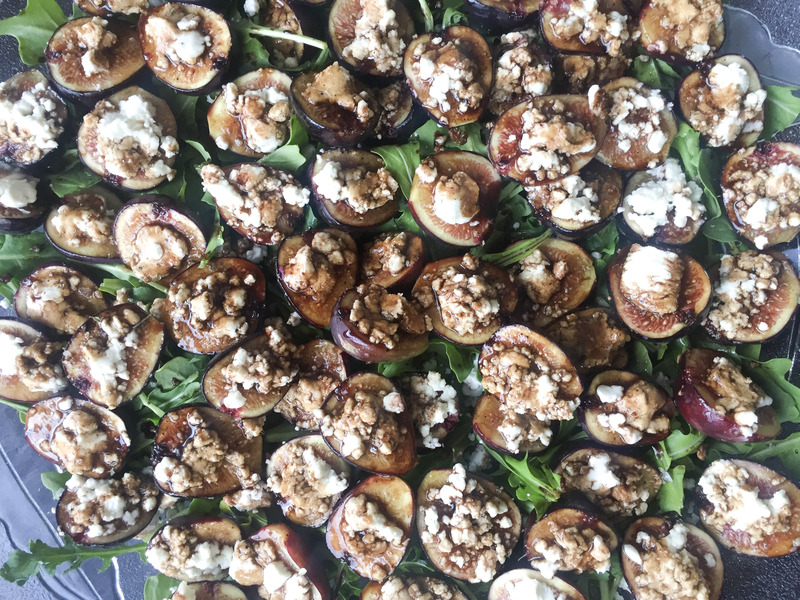 On a medium sheet pan lined with foil, arrange figs in a single layer with the cut side up. Using about 2 oz of the goat cheese, top each fig with goat cheese. Spoon balsamic-brown butter glaze over each fig. Roast for 5-7 minutes, remove from oven and let cool 10 minutes. Plate. In a serving platter, make a bed of arugula. Sprinkle in remaining goat cheese. Place figs on top of greens. Drizzle any available pan drippings over the salad. To taste, drizzle as much of the remaining balsamic-brown butter reduction as you like. Enjoy within an hour. Thanks for all the great fig info! I don’t buy a lot of figs, and this was helpful. Glad the tips were helpful! I’d only experienced figs as dried fruit growing up, so when I had my first fresh fig years ago, it was a revelation. They’re so awesome. But the season is always too short. Hope you get to enjoy some while they’re here! As much as I love figs, I don’t know that much about them so this was an awesome article. Thanks! This seems really simple. I have only cooked with figs a couple of times, thanks for the new idea! Yes Jillian! It’s simple, but still special. Hope you give it a try. Needed this recipe (like right now) – yesterday we pick a ton of figs from a friends back yard. Figs are so delicious. Great post! I need to cook with figs more often! I have a feeling you won’t be sorry. I daydream about it. Figs are on my “to try” list, thanks for sharing all the information! Yes, you must! They are sooooo goood! Yes! 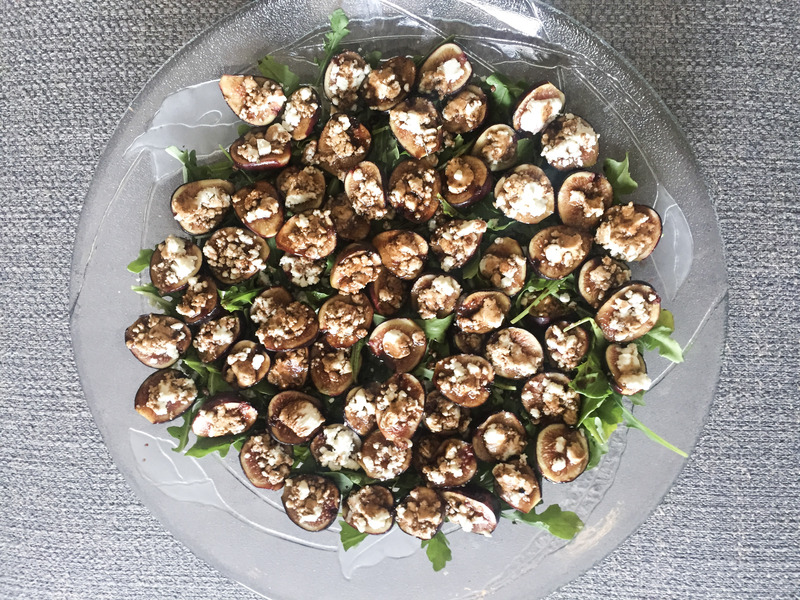 I adore figs paired with goat cheese! So good!